It’s the time of the year when our lush lawns and gardens go dormant or dead. The leaves on the trees have fallen, and we need to prepare ourselves, our gardens and our tools for the snow and freezing conditions of winter. There’s a lot to think about in preparing for winter, all looking forward to spring. 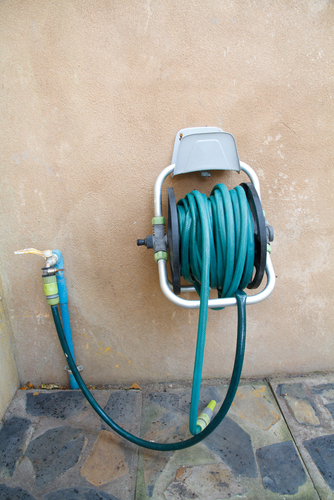 This may be a no-brainer, but be sure and detach all hoses from the faucets on the sides of your house. If a hose is still attached once there’s a hard freeze, the water in the hose will freeze and cause pressure on the water lines inside your home. This could cause a water line break inside the house, which is not only costly and inconvenient, but can damage valuables and invaluables. After detaching your hoses, you can put an insulated faucet jacket on all your exterior faucets. This will protect your faucets, and all the connecting water lines, from the freezing temperatures. You may also use the shut-off valves to cut off water supply to the exterior faucets. 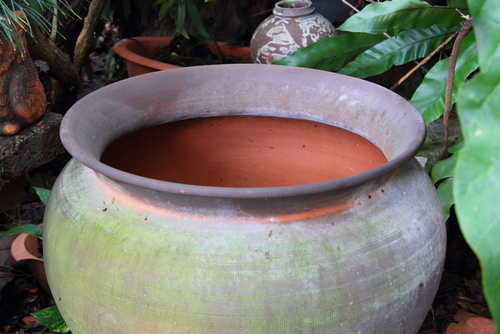 Be it urns, pots, decorative vases or what have you, the freezing temperatures and precipitation can pose a threat to your favorite garden décor. It’s best to move these into an area where temperatures aren’t as harsh, and they won’t fill with water. A basement or a garage will work fine if your home has the space. If you don’t have the room, simply turn them upside down to ensure they don’t fill with water and crack or break when it freezes. If the ornaments are too big to move, cover them with a tarp. It’s imperative to keep water out if you still want them in tact come springtime. 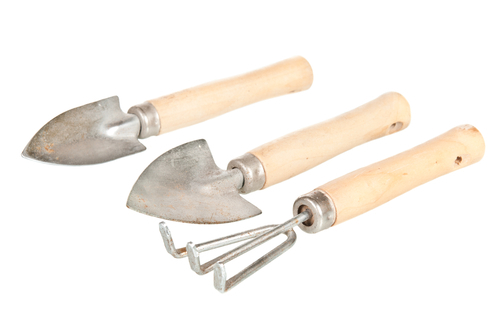 After heavy use in the spring and summer, winter brings a time when your gardening tools get a rest. You’ve got to be careful, though, because the moisture, dirt and debris from all the yard work can be harmful to your metal equipment. Once spring comes, there’s nothing worse than getting ready to do your landscaping clean-up and realizing your tools are ruined. It puts a damper on your mood, and can get expensive to buy new ones. It’s always a safe practice to take care of them before putting them away for a few months. Rust can be detrimental to garden tools. Rust usually accompanies water when mixed with metal, so it’s best to wipe off garden tools after each use. Come the end of your gardening season, a heavier cleaning and maintenance is required to ensure tools are still in good shape when you pull them out again. You may want to sharpen the blades on your tools such as scissors, hoes, prunes, etc. Wipe them down first to get any mud and dirt off. Take a file (which can be found at hardware stores) and rub it along the original bevel of the blade at a 20-45 degree angle until they’re to the desired sharpness. You can do this before you store them for the winter, or before you begin your gardening in the spring. A good way to keep your tools in good shape is to store them in a pot of sand through the winter. Fill the pot with dry sand (“dry” being a very key word, here), then mix in a lubricating oil, such as WD-40. Put your tools in the sand, blades first, and put the pot somewhere it will stay dry all winter. Once it’s time to get the tools back out, pull them out and wipe down the blades with a coarse fabric and they’re ready to plunge into your garden again. More specific instructions here. If you are worried about the WD-40 getting into your soil and thus your vegetables and plants, you can use vegetable oil for a less chemical option. Once all of this has been done and you are fully prepared for the winter, there is not much else to do other than hope it’s a short one. Regardless, springtime will be here before you know it and the fun will begin again. In the meantime, be sure to enjoy your winter surroundings, which – though sometimes may seem sparse – can be just as beautiful as spring, but in different ways.